For mechanical engineers it is important to know the basic concepts of fuels, heat engines, lubricating oils etc. to develop new energy conversion systems efficiently to meet future energy demands of the world and to maintain existing energy conversion systems properly. 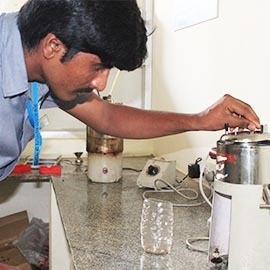 Energy conversion laboratory is a laboratory which emphasizes understanding of the operating principles of some of the component devices that are encountered in engines, power plants, and heating systems as well as experimental measurement, analysis, and reporting techniques. Students will build on their fundamental knowledge of thermodynamics, fluid mechanics, and heat transfer in analyzing the operating characteristics of real engines and heat exchangers. As a result, students will gain hands-on experience with the operating characteristics of common energy conversion devices (and a better understanding of how to apply their fundamental knowledge of thermo-fluid sciences), increase their understanding of statistical analysis methods, and practice oral and written presentation skills. Energy conversion laboratory is equipped with different laboratory learning activities that are related to thermal engineering. 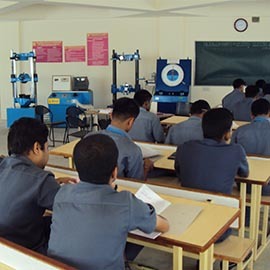 This laboratory gives detailed information about the properties of different fuels, performance evaluation of diesel and petrol engines which are widely used in Automobile, marine and aircraft engines .The laboratory contains different experimental setups to conduct experiments related to energy conversion like to find flash and fire point of fuels and lubricating oils, determination of calorific value of different fuels, valve timing diagrams of IC engines, Performance tests of IC engines etc. By the end of this course the students are able to know the information about the properties of different fuels, performance evaluation of diesel and petrol engines which are widely used in Automobile, marine and aircraft engines.